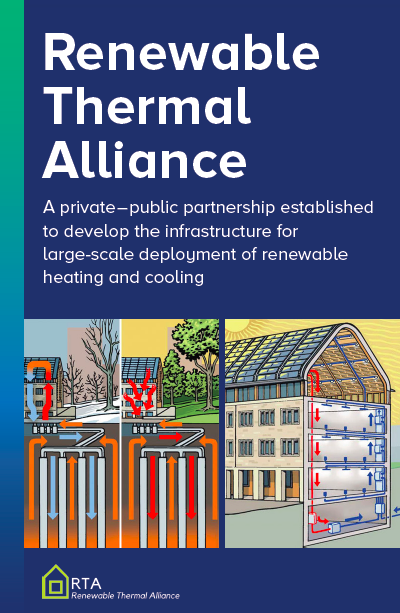 The Renewable Thermal Alliance’s challenge is straightforward: to develop the infrastructure for large-scale deployment of renewable thermal technologies (RTTs) to reduce greenhouse gas emissions through energy savings and fuel shifting. The Renewable Thermal Alliance (RTA), a public-private partnership initiated by NYSERDA, CT Green Bank, and Yale University, has emerged to coordinate efforts among 200 individual stakeholders throughout the US. Renewable heating and cooling are increasingly seen as opportunities to reduce GHG emissions and at the same time increase energy affordability, reliability and resiliency. Heating and cooling nationwide accounted for respectively 65 percent and 24 percent of energy delivered to residential and commercial customers in 2015 (EIA AEO 2017), is predominantly based on fossil fuels and is hence a high-impact area. Based on the notion that the thermal market is regional rather than state bound, that viable business models can add value, that standardization and harmonization will drive volume and that financing models are central to leverage private capital, a network of stakeholders across states has been established. Catalyze and scale a regional market for renewable heating and cooling through the provision of an independent non-profit market-building platform for financing solutions. The RTA engages stakeholders along the whole value chain for RTTs, including regional government offices, green banks, industry associations, contractors, engineers, investors and other commercial firms. The RTA allows for different levels of engagement. The RTA is a vehicle for open discussions across RTTs and stakeholders to deliver on high ambitions. The RTA takes a capital markets’ approach to cultivating a long-term viable market for RTTs. Leveraging private capital is seen as essential to bring the deployment of RTTs to scale. The RTA currently has a geographical base in the Northeast parts of Northern America but welcomes stakeholders from all parts of the continent. The RTA seeks partnership with other RTT initiatives where the mission is shared and synergies can be achieved. Renewable thermal technologies (RTTs) harness renewable energy sources to provide heating and cooling services for space heating and cooling, domestic hot water, and process heating. The RTA works to engage through dialogues leading to new partnerships and project initiatives. The RTA engagement platform includes ongoing interaction through an online discussion forum, monthly webinars and in-person meetings twice a year. The market for RTTs is immature and is analogous to where the solar PV market was a decade ago. Key stakeholders lack standardized performance data to be able to evaluate the performance of the technologies, to estimate risk, and to develop new products and business models. The overall goal of the initiative is to develop a fully-functional data clearinghouse for RTTs that builds upon existing efforts to standardize energy data and best practices. Data dictionaries and best practices for RTT performance monitoring based on current efforts, both regional and national. Consistent and well-documented data quality over time and across state borders. Open and easy access to renewable thermal project data for key stakeholders such as program administrators, policymakers, building owners, academia, manufacturers, Project engineers, installers, entrepreneurs, and capital market participants. You can get engaged in the RTA at different levels. Participate in the RTA engagement platforms – gain and share insights from a vast and competent network in the renewable thermal field. Become a partner to project initiatives. Contribute financially to the RTA. Please contact Helle Gronli by email for more information. Register for the RTA distribution list here. State and Local Energy Efficiency Action Network. (2014). Energy Efficiency Finance Programs: Use Case Analysis to Define Data Needs and Guidelines. Prepared by: Peter Thompson, Peter Larsen, Chris Kramer, and Charles Goldman of Lawrence Berkeley National Laboratory. At this Renewable Thermal Alliance (RTA) web-meeting, Kevin Bourque from Natural Resources Canada presents RETScreen and the opportunities that the tool offers to evaluate whether renewable heating and cooling projects make engineering and financial sense. At this Renewable Thermal Alliance (RTA) web-meeting, Jeff Deason from Lawrence Berkeley National Laboratory presents a study reviewing the possible benefits and barriers to greater electrification in U.S. buildings, the technical and economic potential for electrification, and policy and programmatic approaches for regions that may want to explore beneficial electrification. At this Renewable Thermal Alliance (RTA) web-meeting, Daniel Sternberg from the National Renewable Energy Laboratory presents preliminary results from a multi-year study that develops and assesses electrification scenarios designed to quantify potential energy, economic, and environmental impacts to the U.S. power system and the broader economy. December 11, 2018 at 11:00 a.m. ET - we will present the winners of this year’s RTA Seed Innovation Grant. Register here to attend. January 16th, 2019 at 11:00 a.m. ET - Market Strategies for Renewable Heating and Cooling. Register here to attend. April 25th , 10 AM: RTA Network Updates; the Renewable Thermal Alliance and its members will present exciting business models, solutions, analysis and tools with the potential of transforming the renewable heating and cooling market. May 1st, 10 AM: The US Heat Metering Standard was released end of 2017 and James Critchfield, Director of Green Power Partnership ad US EPA, will give an overview of the Standard and discuss potential opportunities and challenges for the renewable heating and cooling industry ahead. May 22nd, 2 PM: Dr Tianzhen Hong from Lawrence Berkeley National Lab will present CityBES; a tool that can automatically generate and visualize energy models for a large number of buildings based on cities’ building datasets. June 18th-19th in Saratoga Springs NY: Renewable Thermal Alliance and NEEP partnered to organize a workshop on renewable heating and cooling technologies. Wednesday September 27, 2017, 8:30 a.m. — 5:00 p.m.
Thursday May 25, 2017, 9:00 a.m. — 5:15 p.m.
Thursday April 27, 2017, 12:00 p.m. — 1:00 p.m.